Believed to be heading towards a premiere date in August on BBC1, the return of Doctor Who following a high-concept 2013 now has some new content to its name, with the eigth season of its new run (in place since 2005) now boasting a first teaser trailer. A short clip showcases the silhouette of the new form of lead character ‘The Doctor’, portrayed by Scotsman Peter Capaldi, as he stands inside the TARDIS vehicle. 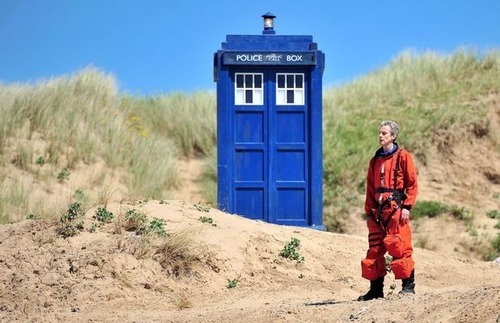 All that has been seen so far of the new season in non-silhouette form, meanwhile, have been a selection of promotional images showing Capaldi (pictured) and co-star Jenna Louise Coleman wearing orange space suits on a beach. Also known about the 13-episode sci-fi run is that guest stars will include Keeley Hawes, Ben Miller, Hermione Norris, Tom Riley, and Frank Skinner, amongst others.